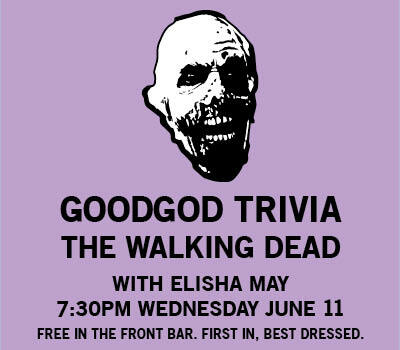 Grab a crew, essential survival gear, and hide out in Goodgod’s party bunker… we’re doing WALKING DEAD trivia! Hosted by the fantastic Elisha May, we’ll be looking at all four seasons of television’s finest post-apocalyptic drama. Get in early for best spots, and play to win! First questions from the brand new starting time of 7:30pm. Free free free!